WiFiWi.Fi lets you manage every aspect of your Wi-Fi. WiFiWi.Fi makes a wide range of tools available created to allow you to control your Wi-Fi network with ease. Thanks to the user-friendly interface, you can reach all the features in a few clicks, adjusting the service to your requirements and providing the best experience to your customers. Let your customers connect choosing among many practical methods: via Facebook or Twitter, email address, telephone number, PIN, and access key. Choose whether to let them access autonomously or to provide them with login credentials yourself. Free Wi-Fi. Paid Wi-Fi. Or both! 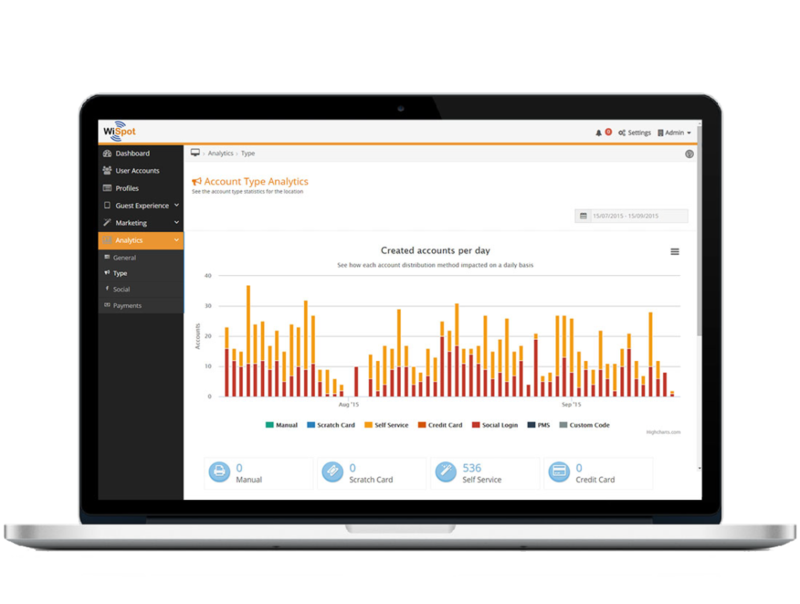 WiFiWi.Fi lets you decide whether you want to offer free Wi-Fi to your customers or paid accounts in order to increase your business revenue. Wi-Fi billing made easy. Set the access duration, choosing among different time calculation methods: single session, accumulation, periodic. Protect your data, with secure and reliable encrypted authentication for Administration network. Let users login to their accounts by themselves without hassles. Let your users login using secret codes that you provide. Print access vouchers and give them to your customers, defining service price and duration in complete autonomy. Collect user data in full compliance with the current privacy and security regulations. Make your Wi-Fi work for you!